As Trivex lenses have a high ‘Abbe’ value of 45, they offer sharper peripheral vision with less chromatic aberration than polycarbonate lenses. These lenses are configured specifically for sports use, with a revised optical centre to improve peripheral vision and overall balance. The overall effect is to achieve crisp vision throughout the optical axis – which is ideal for active watersports. There are two ways to purchase our RX Watershades. If you have an up-to-date prescription with you (i.e. it is less than two years old), you can proceed directly to our webshop using the ‘BUY NOW’ link below. If you do not have a current prescription, or would like a quotation or to discuss your prescription requirements with us, please click “SUBMIT YOUR RX ENQUIRY HERE” button below and complete the questionnaire. We will contact you to discuss your requirements. We set out below some details about the types of lens coatings / colors that are available in our RX range. If you need any additional information, please contact us via the link at the bottom of the page. For nearsightedness, farsightedness and astigmatism, our single vision lenses are the standard option for customers who want to leave their contact lenses at home. Our RX single vision lenses can accommodate sphere readings of up to +6/-8. Options include fixed tint, photochromic, polarized or photochromic and polarized. Single Vision lenses take 2-3 weeks to manufacture once we receive and verify your prescription details. Our varifocal lenses are for customers that require two prescriptions in their lenses – one for distance and one for reading. The most obvious scenario where varifocals are required are when sailors need to read instruments and dials while at the same time being able to see in the distance. For Varifocal lenses, the production takes about one month. After you have placed your order, we will send you a sample frame and RX form in the post so that you can attend your optician and obtain all the required readings, most importantly the ‘Segment Height’. Once we receive the completed RX form, it takes 2-3 weeks for us to manufacture the lenses. Our single vision and varifocal lenses are all DirectRX, meaning that there is one continuous lens surface on each lens. This reduces the tendency for dizziness and avoids eyelashes brushing against the lens. It also reduces lens weight and vastly improves peripheral vision. Our fixed tint lenses (non-polarized) are available for both single vision and varifocal lenses. We have two base colors – smoke and brown. The smoke lenses have a transmission rate of 15%, whereas the transmission rate for the brown lenses is 12%. The transmission rate describes the amount of sunlight that passes through the lens and into your eyes. Please consider the weather / light conditions in your home spot before choosing your lens. As the brown lens has a lower transmission rate, technically this means that less light will enter the eyes compared to the smoke lens. However, it is worth noting that brown lenses tend to perform better in lower light conditions and smoke performs better in higher contrast / bright conditions. Our photochromic lenses bring additional functionality by transitioning darker or lighter as you move in and out of the sunlight so that you can continue to use your sunglasses in all lighting conditions. A full transition from light to dark takes 69 seconds on average. These lenses are suitable for users that regularly move between different lighting situations. A good example is a navigator who frequently goes below deck to work at the chart table. The transmission rates given are for inside / outside. 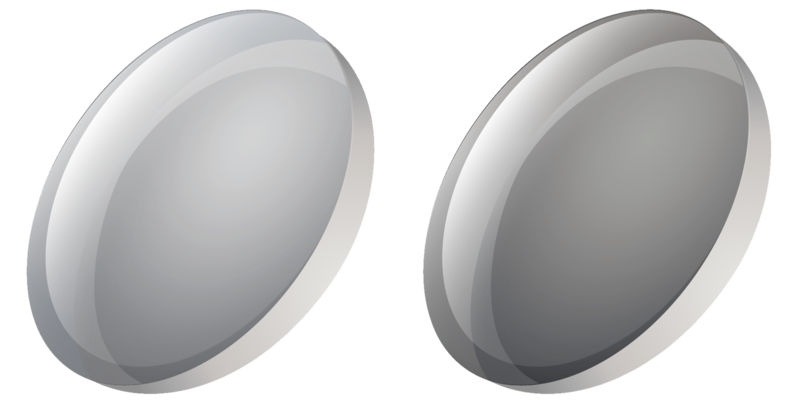 Silver, blue and red mirror coatings are available for all our photochromic lenses. 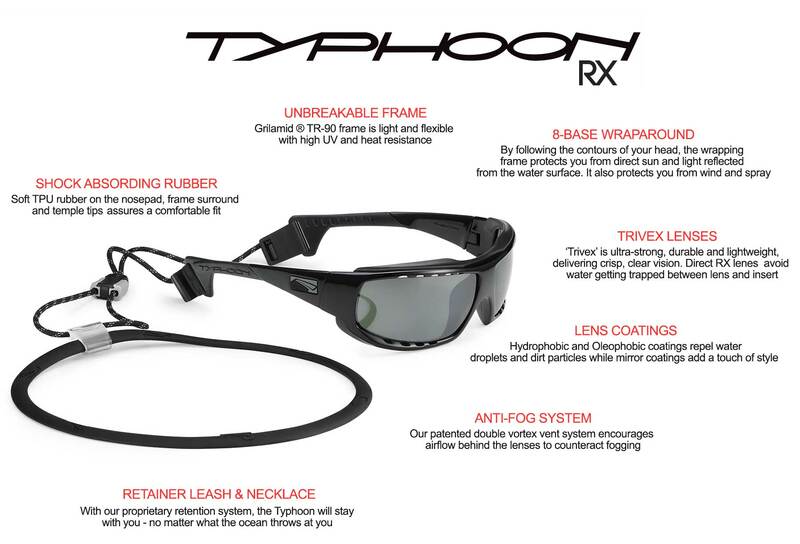 Our polarized RX lenses are perfect for kitesurfing, windsurfing and other active watersports where you are close to the water, as they reduce glare significantly by blocking out reflections. Polarized lenses also vastly improve visibility when driving. As with our fixed tint lenses, there are two base colours – ‘smoke’ and brown, and there is then a selection of colored mirror coatings for each base color.